It's Pawpaw or Asimina Triloba season and the race is on. This fragrant and unique tropic style fruit is the largest fruit native to the Americas. It's growth spans mainly along the Eastern United States and even up into parts of Canada. The harvesting period for pawpaws ranges from late August to Early October, depending on your region. This sumptuous gem is a combination of flavors, akin to a banana, a melon and muted tones of pineapple. 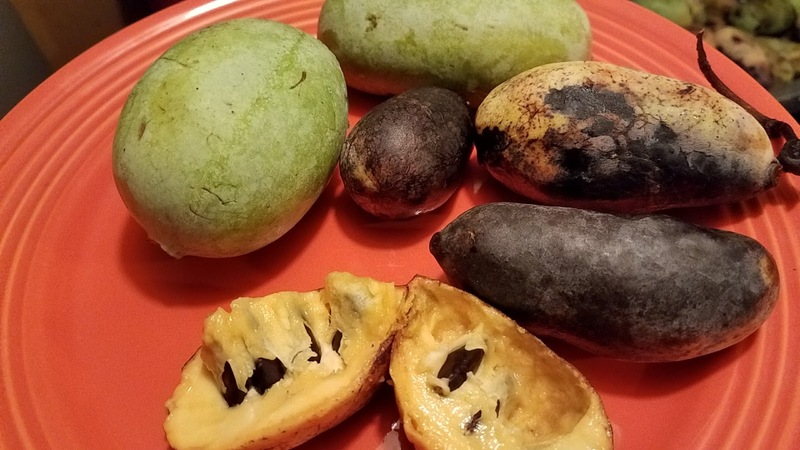 Pawpaws have many colloquial references, including Indian banana, poor man's banana, Kentucky banana, custard apple and banango. A friend of mine noted that the smell of a more firm pawpaw is very much like the smell of a cut pumpkin, and I agree. The fully ripe pawpaw bursts with tropical fruit scents, like mango and pineapple, and wonderful citrusy notes as an afterthought. The best tasting pawpaw is one that is admittedly not the most appealing to the eye. I have tried this fruit in many stages, and the ugly state wins by a landslide. Pawpaws have a very volatile shelf life, about 2 days once fully ripened. However, you may place them in the fridge to retard that process and keep them for about two weeks. One thing I did notice was that the ones kept in the fridge for such a duration looked fine, but seemed a bit dry and not as fragrant as the one left to age naturally on the countertop. The pulp of the pawpaw however, may be frozen and used at your convenience, which is an awesome plus. The process is a somewhat arduous task; peeling, removing the seeds and accumulating pulp, but well worth it. Pawpaws have a system of seeds that run though the middle. They resemble kidney beans, and are about the same size as well. The seeds are toxic to humans, so discard accordingly. After the work, alas comes the play, which leads us to my take on the French Beignet, featuring pawpaws. 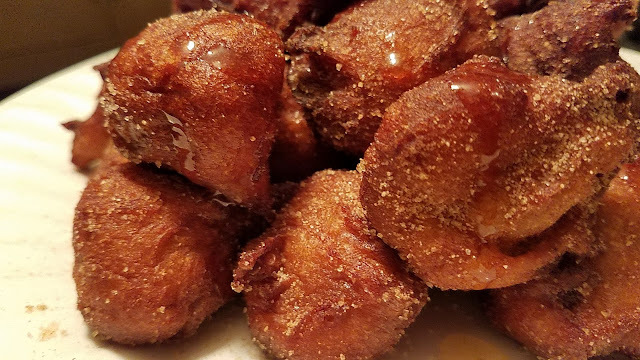 I made a 'master batch' of spiced pulp and used a portion to make these beignets, but you may use the pulp as is. Cinnamon Sugar and Agave Nectar for garnish. Heat about two inches of vegetable or canola oil until appr. 350 degrees. In a small sauce-pot or pan, heat puree and sugar to boiling over medium high heat. Remove from heat and add dry ingredients. Beat in eggs, one at a time and stir with wooden spoon until thick and batter pulls away from sides of pot. Drop in oil using a tablespoon and without crowding, fry until golden, about 2 1/2 minutes. Drain on paper towels and toss with cinnamon sugar while hot. Drizzle with agave and serve immediately. So happy to have found your blog. I met you in altavista and you were so kind to give me your website information. Love the photos and stories.